Want to save money without feeling like you're absolutely broke? The good news is, you don't have to. In fact, it's quite easy to save money if you make a few small lifestyle changes here and there. I'm sure you'll be happy to know you can put some cash away without going ultra frugal. I don't know about you but I still like to live some kinda normal life when saving money and I would presume you do too. I'm not going to keep you waiting. Here are 19 ways to save money easily without being a penny pincher. Sign up for Paribus and find out if stores owe you a refund – effortlessly! Paribus scans for price drops at stores with price adjustment policies. Then if you're owed money Paribus will get it for you and get it paid directly to you free of charge. Sign up to Paribus and see if you're owed cash back. When you sign up to Ibotta you get rewards and savings every time you go shopping. Simply check Ibotta before you shop, travel, dine out, or purchase something in your favorite apps. You then make savings when buying the things you're going to buy anyway. Ibotta works with many big names brands and retailers to help save you money. Sign up to Ibotta for free here and start getting rebates today. With Ebates you can earn Cash Back rewards at your favorite stores! You get unbeatable shopping deals, promo codes & coupons with Ebates. Ebates is also free to use so it's defo worth checking out. Sign up to Ebates for free here. I was blown away by how much less my household food bill was each week after ditching the meat. I cut back on meat out of wanting to eat a more plant-based diet and was pleasantly surprised at the difference it made to my waller. I would estimate it cut the weekly shopping bill by a third. You don't need to stop meat altogether but cutting back to just a few days a week will have a massive impact. Even just a can of coke and a chocolate bar a day ads up to $50+ a month. My fiance and I used to get a least 1 can of coke and a cholate bar each night and once we stopped doing this (again out of health reasons) we saved a nice chunk of money each month. Give it a go and see how much you'll save on those sneaky little shop visits each day. You can save a few ways from sharing a car. If you can manage with one car then you'll get money for your old car and you'll save on your insurance costs. Not to mention any upkeep costs. My fiance and I ditched our second car as didn't use it that much and it didn't affect our lives in a negative way. We still got to where wanted and did the things we usually did. And yeah sometimes we had to plan who was using the car at what times. But overall it was pretty easy switching to one car and it saved us about $150 a month on costs. I buy all my clothes when there are deals happening online. I still like to buy nice clothes so I keep an eye for deals online and then buy what I want when a store is doing a weekend sale with say 50% off. I brought my self some really nice kicks the other day and I got them half price in the January sales. I knew I wanted these when I saw them so I waited about 3 weeks till the shop had a sale then got them with 50% off. The best deals are normally online and I would recommend comparing multiple stores if there's something specific you want. I'm not saying don't work out but you might not need your Gym membership. Most people have memberships they don't even use. However, if you are a fitness buff then you might want to try other ways for exercising. Calisthenics is a great way to exercise and is totally free to do. It's all done with body weight exercises. If you're lucky enough to live in somewhere with Calisthenics training parks then get stuck in. You can also run or cycle for cardio training. Not sure if you can get it good shape without a gym membership? Check out this street Calisthenics training video. Prep your food and take it out with you. Whether it's for work or for trips out with the family. Eating out is so expensive and most of the time it's not that great anyway. If you can walk or bike to work then why not save money and get some exercise in the process. You'll be saving money and getting healthier in the process. I love a good walk with some uplifting music. It gets me feeling good about life and I always feel happier! If you smoke then you'll save a fortune if you quit entirely or at least switch to vaping. Vapes shops are everywhere and have some great flavors. It's so much better to vape than to smoke. I used to smoke so I know it's not easy to stop. I also vaped and know how much cheaper it is to vape. I went from cigarettes to vapes and then I eventually quit with the help of Alen Carr's Easy Way To Quit Smoking book. That book has literally helped millions of people quit smoking and with ease. If you smoke then reading that book could be the best choice you ever make. Again I used to drink A LOT! I've stopped drinking for over 2 years as of writing this and I've saved a fortune (not to mention a few sore heads in the mornings). I recently went to Thailand for a 2-week vacation and I was so surprised how much less money I spent this time in comparison to the time I went before when I drank. Not only did I spend less I actually DID MORE! The health benefits are amazing as well. It's a win-win. Save money and feel better! If you cut back on dining out and eat at home more you'll save a good amount of money. Depending on how many are in your family it can be quite substantial. It can be quite enjoyable to cook a nice family meal and sit down and enjoy it together each night. It helps grow that family bond plus it's so much cheaper to cook at home. I couldn't write an article about saving money without mentioning coupons. Magazines usually have plenty of coupons for you to use. These may only seem small but they add up and contribute to the overall savings you will be making each month. It's much easier to use a rebate tool though, like Paribus, iBotta or Ebates if you have a smartphone. Sign up with them below, they're free to use and they're the most trusted 3 rebate tools available. —> Sign up to Paribus here. —> Sign up to Ibotta here. —> Sign up to Ebates here. Things like toilet paper, shampoos and washing powders go on offer from time to time and it's worth buying in bulk when they do. As you buy these things regularly and they are a necessity then it's worth picking up a few when they are on sale. Don’t leave lights on when you don't need to. Lower the temp on your thermostat. Turn down the water heater. If your water isn’t being heated over 120 degrees, you are saving on energy. It's so easy to buy extra things you don't need when going shopping. If you're trying to save money then it's time to get ruthless about using that shopping list and sticking to it. Make sure you write down everything that you want to get then only buy those things when at the grocery store. I know it's hard to not pick up those enticing offers by the checkout but stay strong, you can do it! This ties in with the last one. If you eat before going shopping then you won't want to buy all that tasty looking food you see when navigating the aisles. I know for a fact that when I shop when hungry I buy loads more food that I shouldn't. Must of it is junk food that I don't need to be eating. If you shop weekly and you spend an extra ten bucks on foods you wouldn't have bought if you weren't hungry, then that's $40 a month saved by going grocery shopping on a full stomach. Since the last 2 were on the shopping theme then it's worth mentioning it can be a good idea to order your groceries online because that way you'll definitely only buy what you need. Plus you'll save on the gas driving to the store and back. For example, I buy a lot of books as I'm a big reader and I always buy second hand off amazon or in charity shops. I would use a library but I like to collect books as well. DVD's is another thing I buy second hand. The other day I wanted to watch a TV series which wasn't on Netflix and on Amazon it was $20, I had a look on eBay and got it for $4 delivered. I saved $16 and watched the TV series I wanted. There are lots of other things you can buy second hand. Like clothes, furniture and even buying a car just a year or 2 older than if you where to buy it brand new would save you loads of money. Is there anything you've bought or want to buy that can be got for less second hand? 19. Keep track of what you spend. The simple act of keeping track is a great way to make you more aware of what you're spending money on. Write everything down you spend your money on each day, then review it at the end of the month. I'm sure you'll see a lot of things you could stop spending money on. It's the same with dieting. When someone writes down everything they eat each day, then there's no way to be in denial about what they truly eat each day. When you become aware of all the pointless stuff you spend money on it'll be much easier to stop buying the things you don't really need or even want. 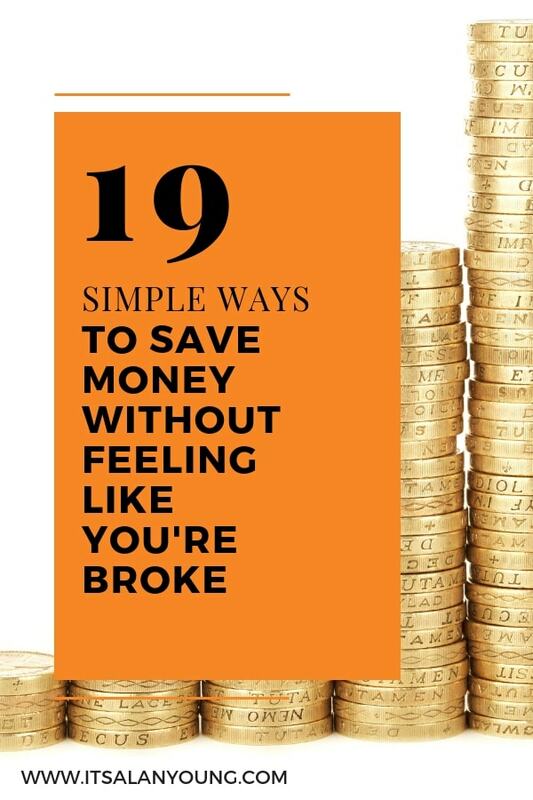 19 simple ways to save money without feeling like you're broke. Also, feel free to pin this post so you can come back and check it out at another time.